Is Figurehead Just a Decoration of the Ship? “Every single part of the yacht has its purpose; none of them is there just for a decoration”. I have said this line so many times when I was teaching people about sailing and navigation either as students on sailing course or as first time sailors on vacation. So, what about the figureheads, so characteristic for traditional ships? Is figurehead really just a decoration? I wouldn’t say so. The sea was always something mysterious to the people. Throughout the history of civilization the seas have always been mentioned as a world for itself, overawing, sometimes terrifying, but generally unknown. Therefore, different civilizations linked the seas with different mythological beings such as gods, nymphs or other good or bad creatures. Since the seas in the early days of civilizations were unpredictable and navigation was adventurous due to lack of forecasting systems, people wanted to help themselves and make it easier to get back alive from the seas. It should not surprise that people used to paint different symbols on the prows or bows of their vessels in order to protect the vessel and the crew from evil influences and accident in general. The early Egyptian vessels had the symbol of the eye painted on the bow, which was there to repel the evil. Some researchers connect such symbol as the eye of Horus, the most popular Egyptian talisman. Furthermore, the statues of mythological beasts were put on the bow of the ships with the same purpose – the beast on the vessel is strong enough to repel all menaces coming from the sea. Ancient Phoenicians used to put horse heads as symbols of strength, skill and velocity; desired virtues at sea. Interesting dragon like statues characteristic for Viking ships were an integral parts of their ships while figureheads as separate part of the ship became exceptionally popular in the era when shipbuilding considered stem heads on which figureheads as such could be placed on. Although it was not until 16th that the steamships appeared, seamen were superstitious so figureheads presented a very important part of seamanship of the time. The beasts and personalization of gods were substituted by mostly the figures of beautiful ladies and/or mythical creatures such as sirens or even saints and angels. It was still believed that a figurehead would lead the ship safely through the troubled waters. 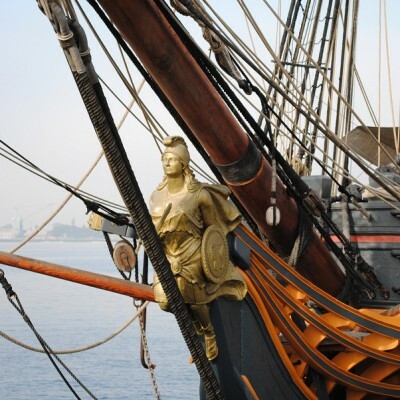 It is interesting that covering the figurehead was customary during thunderstorms at sea. The best example of how much the crew believed the figurehead had supernatural powers is the custom of covering it while piracy or some other dishonorable action.